The tomatoes are looking like skeletons, the cucurbits are covered in powdery mildew and it’s time to say goodbye to warm season crops and clear the way for the final flavors of the season and then the dormancy of winter. Nothing like a new baby to make a few months disappear. We welcomed Malakai Wolf to the world on August 5 and it has been quite a ride adjusting to being new parents! And suddenly it’s here, the first few days of October, the Jewish holidays, the rain, the chill and the FALL! Here we are at peak summer and all that early season work should finally be paying off. All those fruiting plants: the tomatoes and cucumbers, zucchinis and eggplants, peppers and summer squash are all ripening on the vines. 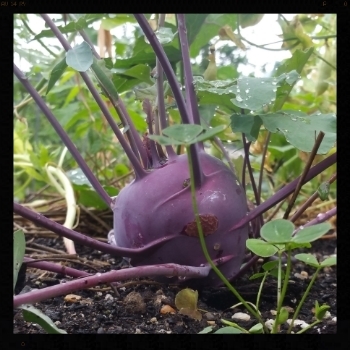 The onions, garlic, shallots as well as beets have matured and can be used now. The basil and other summer herbs are still going. Now is the time to be creative in the kitchen and, if you can stand the heat, get your Farm To Table cook on. Unfortunately, this is also the season of fungal diseases, summer pests and extreme heat- so it can be easy to get distracted worrying about your plants survival. Indeed, the game now is to see how long you can keep some of these annual plants alive and yielding before they succumb to their eventual seasonal demise and make way for the rich hearty flavors of fall. Truth be told, one of the real skills of a grower is getting the timing right. Many of our favorite fall crops must be planted around mid-August if they are to yield before winter conditions arrive, but often those precious summer crops are still occupying garden space long past that window. What to do? Well, the first thing is make sure to have a garden plan to serve as a roadmap and guide planting decisions over the course of the season. Edible Eden offers garden plans for any size garden that will help maximize your space over the course of the season. If you don’t have a plan in place; consider interplanting some fall crops in and amongst your yielding plants over the next few weeks so that when they do go down your kales and cabbages will rise to the occasion and fill their space. Here at 2601 Taney, we are thinking a lot about timing as we continue our extended baby watch. Teri was at 40 weeks a week ago and now we are trying to go about our lives knowing that at any minute labor will begin and we will need to step away from whatever we were doing and head to the hospital. It’s a good thing we have plenty of beautiful produce to munch while we are waiting! Stay posted for news of the soon-to-arrive baby Rosenstein and enjoy that summer produce while it’s here. Coming into the last few days of June it is time to get those brassicas out of there. Maybe you have had lingering broccoli heading up slowly in the early summer heat; or big beautiful kale plants playing their unique role in your garden aesthetics...well, their time has come! While Edible Eden was founded to support people in local, seasonal eating and we do get most excited about interesting food plants...we also design and install ecological pollinator gardens using native plants and perennial cutting flowers. It’s finally here, the long awaited garlic scape season- a bit early this year I might add. Garlic, as you know if you’ve planted it, gets planted in the fall in our climate, hunkers down beneath a layer of mulch all winter, and sends up a soaring, swan necked flower head in June. Nothing says Mother's Day like Shiitake mushroom logs! With the Fall coming on quickly thoughts turn to preserving some of our harvest so we can enjoy local foods during the cold months when little is growing. We have multiple options available to us when it comes to putting up goodies for the off season. The simplest and quickest option is blanching and freezing. Many vegetables lend themselves to blanching and freezing and hold up well in the freezer. Zukes and summer squash, beans, carrots, beets, turnips, peas, and kale are all good options for blanching and freezing. To do this, wash and chop them into suitable sizes, drop them in boiling water for three minutes, then into ice water until cool, then lay them out on a cookie sheet and freeze. The next day put them in clean, ziplock backs, label and forget about them until January! Another great craft to explore is pickling. When creating pickled delights we can choose to lacto-ferment or vinegar pickle. Lacto-fermentation is an artisanal method of food preservation that has many heath benefits and creates amazing and unique flavors. It involves creating the right conditions for healthy microorganisms to come and do their work of breaking down sugars and releasing lactic acid which acts as a preservative. Old school sour or half-sour pickles, dilly beans, saurkraut, and kim chi are some great options for fermenting. Vinegar pickling involves making a boiling brine of vinegar and seasoning and pouring it over fresh vegetables. Cucumber, sliced beets, baby onions, asparagus and okra are great veggies to vinegar pickle. This method is the best way to get a shelf stable product that doesn't need to be kept in the fridge and can create some really fantastic flavors, although it has no health benefits. Canning is the process of creating a shlef stable product by sealing mason jars using heat. With canning you really need to follow correct procedures to avoid food borne illness so best to do it according to concise directions- or better yet, do it with a friend or family member who has experience with canning. Pureed tomatoes, jams, and vinegar pickles are all good options for canning. Dehydrating is also a good option for preserving veggies; if you have a dehydrator you can create the best backpacking foods ever! Regardless of how you go about it, make sure to try out a food preservation technique this late summer as there is nothing so satisfying as eating homegrown produce from your MidAtlantic garden in the cold weeks of February. To learn more join us at another free Edible Eden workshop on preserving the harvest Sunday afternoon, Sept 20, 4-6 pm. When was the last time you watered your garden...? Oh, you say, not since May? That may be because it has been raining pretty consistently all summer long. While I have certainly enjoyed the might and glory of our Mid Atlantic thunder storms, and it's nice to never worry about watering... the ramifications for gardening are not so great. You might have noticed most tomato plants wearing some forlorn yellow to brown leaves around their base- those are signs of Early Blight or Septoria, fungal diseases that get worse when the plants never get to fully dry out. I've also noticed mosaic virus and downy mildew on cucumber and squash plants- these fungal diseases usually take down your squash and cukes...but not until the end of the season. With so much rain they seem to be moving faster and earlier then usual. All this to say, every season is different, sometimes it's dry and if your irrigation system is weak or faulty you start loosing plants. Some seasons it rains every day and while we never need to worry about watering...everything dies from a fungal disease. -First of all, if you have an automatic irrigation system- make sure it is not adding insult to injury by watering when all your plants want is a chance to dry out. -It's a good idea to remove the small branches and leaves around the bases of your tomato plants to create more airflow. -Mulching with straw could help keep fungal spores from bouncing up from the soil to the lower leaves of plants. -If you are only seeing the beginning of fungal disease on your plants you might consider spraying some Actinovate or another organic fungicide to try to beat back the progress of the disease.